The player finds MP3s on a given web page, creates a playlist and a very simple overlay to play the songs. 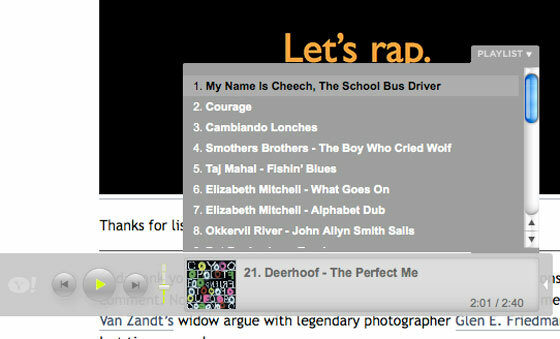 A small play icon is placed next to every MP3 link, and the player itself hovers over the bottom left of the page. It can be expanded to show a playlist of all files on the page (Yahoo is using the XSPF format). This is clearly just a first step in whatever they’re doing over the long term. There are hints at monetization strategies – file names are linked to Yahoo search, for example. I spoke to Yahoo Director of Product Management Lucas Gonze, who won’t say how Yahoo plans to expand the product over time. I can imagine they’ll soon be adding other file formats, including video. Most people have installed browser plugins that automatically play files linked from web pages. And many sites also have flash players embedded into the site (Yahoo has a Flash player too, built on the same code base). Both, though, require software downloads, even if it’s just Flash. So while this is a very simple solution offered by Yahoo, it does not require any software on the PC beyond a browser. That’s a good thing. To see it in action, check out Ian Rogers’ blog.